German potato & bacon salad! 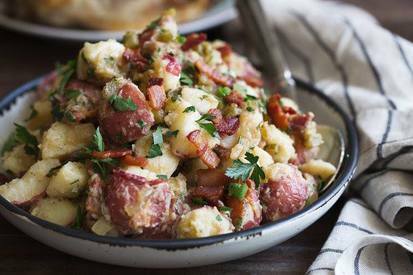 German potato salad swaps the mayo traditional in American potato salads for a vinegar and mustard based sauce. This particular recipe originated with some leftover potatoes after a lobster bake! Rather than keeping the potatoes and serving them as a plain boring dish, I decided to halve them and serve them with vinegar based sauce to make a rendition of German potato salad with Bacon. Since this dish is more on the acidic side, I use a little sugar to cut some of the acid.